With all the modern interest in multitasking, packing machines continue to offer more and more options. However, IPak believes that there’s something to be said for doing one thing and doing it well. That’s why, with the TF-100 tray former, they have created a machine that specializes solely on forming 4-corner trays. 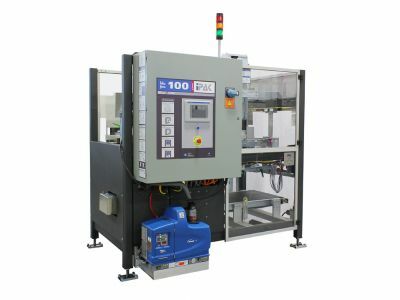 Efficient, high-performance and easy to use, the TF-100 is an amazing value for anyone in the beverage, hygiene, pharmaceutical, electronics or processed foods industries. In this post, we’re going to take a closer look at the TF-100 and discuss why it’s a great option for customers that have limited floor space, a limited budget or limited experience with tray forming machines. When you only need to do one thing – form 4-corner trays – the TF-100 can’t be beaten. Using passive compression technology, trays are formed with minimum crush and tight, secure glue seals. As a result, the machine ensures high-quality trays without the difficulty, encumbrance or expensive maintenance of more complex automatic tray formers. With its small form, the TF-100 can be integrated into almost any operation. Because of this, it is an ideal solution for manufacturers that need a reliable, straightforward tray forming solution but – for a multitude of reasons – cannot devote precious floor space to a larger machine. The TF-100 comes loaded with the features that IPak’s customers have come to expect. From a user-friendly HMI touch screen to interlocked safety guarding to heavy duty construction, the TF-100 is designed to do the work that you need it to do and, more importantly, to do that work for reliably for a long, long time. At Technical Packaging Systems, we have acted as a packaging and material handling distributor to nearly every industry. No matter what industry you are working in, we have the ability to design and implement a fully-integrated packaging line into your operation. If you’re looking for a turnkey solution to your packaging needs, contact us today to discuss how we can help!